The benefit to having memberships at some of our local attractions is that our memberships often transfer to other places around the country. 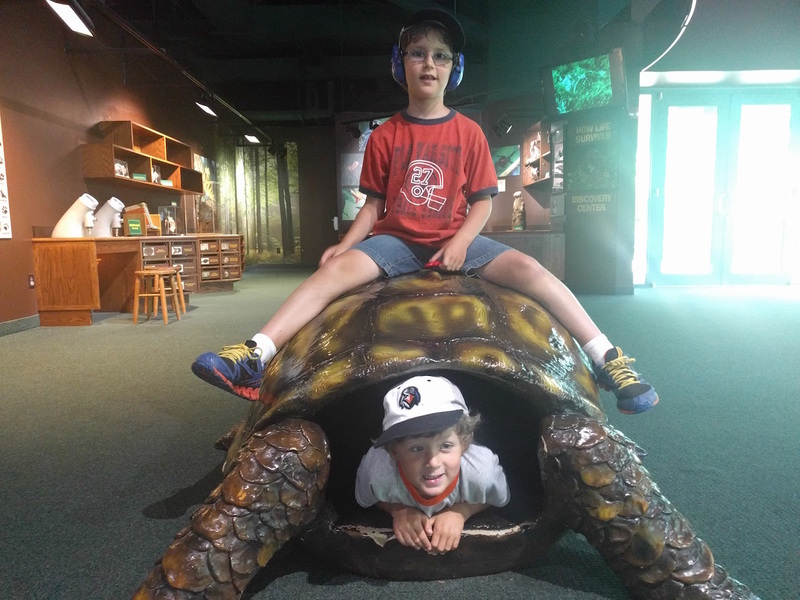 By benefit of our membership at the Maryland Science Center, we have access to interesting museums around the country… like the Virginia Living Museum, in Newport News, VA. The VLM is not too far off of Interstate 64, with a reasonably-big, free parking lot. The main museum building itself is a two level structure right off the parking lot, with two wings filled with exhibits about living things in the state (duh) in a variety of environments. Each wing of the building has a larger faux-outdoor space attached to it – reminiscent to me of portions of the National Aquarium in Baltimore – which has a broader ecosystem. The beauty of the museum, to me, is the large outdoor habitat that they have behind their building with a walking trail that lets you see some of the animals in their natural surroundings, as well as a faux dinosaur expedition site that’s a recent addition. There is also a planetarium and observatory in a separate building on the property. 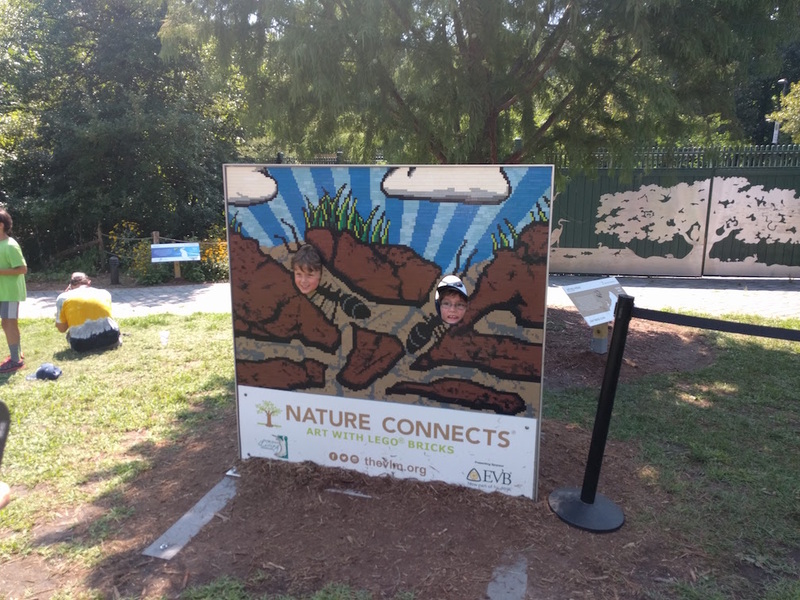 The VLM also hosts traveling exhibits, such as the Nature Connects Lego-art exhibit that was there when we visited this year, or the animatronic dinosaurs that were there the year prior. We’d decided, for this year’s trip, to hit the VLM on the day of the solar eclipse – there were, remarkably, few places in the Norfolk area that seemed to be featuring events for the eclipse, and the VLM was one of them. The garden between the main building and the planetarium was set up with stations where anyone without glasses could peek at the eclipse through specially made filters, prepared telescopes or, worst comes to worst, duck into the planetarium to see the broadcast of totality from NASA TV. In terms of accommodations for special needs… this museum has very few that are specific for it, but they’re fantastic anyway. The Monster had no problem with the restrooms (though one ought note that there aren’t any bathrooms along the walking trail), and the facility itself is laid out that there are no mobility issues. The entire place – even when it was crowded as it was when we went this year – was fairly quiet, and except for the heat and the way R can sometimes rile the Monster up, it was a perfect place to duck out for a few educational hours. There were no places where loud sounds were present, no flashing lights, and aside from the uncontrollable aspect of the environment outside, no extremes of heat or cold to be found. It’s a soothing, educational environment and makes for some well-spent hours away from the hustle and bustle. Honestly, even if we’d not had reciprocal privileges from the science center (in retrospect), this would have been a fabulous place to check out. I highly recommend it as a sight to see if you’ve children with Special Needs (or even NT children like R) for whom animals and the natural world would be an attraction.